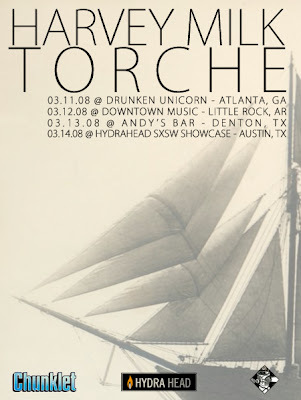 TORCHE: NEW ALBUM, SXSW, MERCH, and MORE!!! NEW ALBUM, SXSW, MERCH, and MORE!!! Torche's second full-length, Meanderthal, is set for an April 8th release through Hydra Head (vinyl to be released on Robotic Empire). 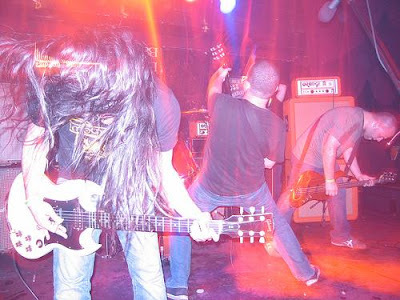 Recorded throughout November 2007 at God City Studios, the 13 track album is Torche's first with Kurt Ballou (Converge, Genghis Tron, Disfear) at the helm. We also just posted a new track from 'Meanderthal' on our myspace page. Be sure to check it out! http://www.myspace.com/torche. "Yeah, that track title’s about right. This new song, “Piranha,” from Torche’s forthcoming Meanderthal album, shreds with short, razor-sharp riffs that do their business quickly and then swim away searching for fresh meat. Vicious sure, but also sleek and hyperdriven (think Queens of the Digital Age). And them glazed over vocal harmonies sure are friendly, like a pack of twenty-fourth-century biker dudes inviting you to join them as they traverse the galaxy on their rocket-hogs. “Piranha” isn’t a huge departure from the sound of Torche’s self-titled debut or last year’s In Return EP, but you won’t find a shorter song that rocks harder, guaranteed. This is what getting stoned in the future will feel like." 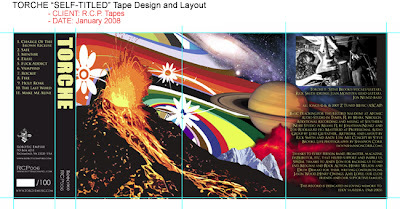 For SXSW this year, TORCHE will have limited edition cassette versions of our first full length. Only 100 of these will be made. I reworked the layout to properly fit the cassette J-Card and I think it came out looking really good. 30 of these will be available for mailorder online once they arrive in the mail. Try and keep a hard eye on the TORCHE myspace page and this blog for updates on that! are there any tapes available?